Preheat your oven to 400 degrees F. On a baking sheet, spread out sweet potato spears. Drizzle them with olive oil and sprinkle with a few pinches of salt. Transfer to the oven to roast for 20 to 30 minutes, until tender when poked with a fork. Meanwhile, add your chipotle peppers to a food processor and pulse until minced. Add the mayonnaise and pulse again until combined. Give it a taste and salt according to your liking. 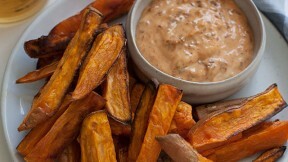 Remove the sweet potato spears from the oven and serve alongside the chipotle mayonnaise.